No matter where you are from, winter and some kind of ice skating are synonymous. Given how long our winters can be, it’s no wonder that there are plenty of places to skate in Gunnison County. Town league hockey, figure skating or just cruising around on the ice, you can pick your favorite way to enjoy ice skating. 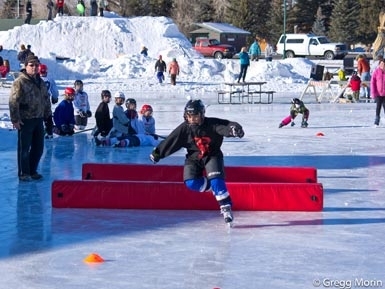 Gunnison is home to a thriving hockey program. Jorgensen Event Center has a variety of amenities, including Nordic ski trails and a jib park for park skiers, but the highlight is definitely the ice. Featuring an indoor ice facility, outdoor ice rink, and a frozen pond for public skating, you will find the perfect ice for your needs. Gunnison is only a short drive from the Blue Mesa Reservoir, Colorado’s largest body of water. Of course, where you find water, you find ice in the winter months. Some daring visitors and locals like to get out and ice skate on the Blue Mesa. The lake is 20 miles long with 96 miles of shoreline and the size of the lake coupled with waves means you don’t get perfectly smooth ice, you get cracks and the occasional pressure ridge. If you do go for an adventure on Blue Mesa, you should take some precautions, like bringing a rope and a buddy. In Gunnison-Crested Butte, we have many ways to travel on snow and explore the outdoors. Skiing and snowboarding are popular, but you may also want to consider a peaceful trip across the snow in a horse-drawn sleigh. It’s a wonderful, cozy way to spend some time with loved ones moving at a different pace. Although you probably won’t find a sleigh traveling down Elk Avenue in Crested Butte or Main Street in Gunnison, you can experience the joys of this special old-fashioned way of getting around in Almont from the Almont Resort with Fantasy Ranch Outfitters. Their sleighs are traditional “one-horse open sleighs” (yes, just like the song) and can fit up to 4 adults and 2 small children. You might see wild life such as elk, deer, or big horn sheep. Don’t forget to cozy up by the fire with hot chocolate when you get back. If you want the full experience of our winter wonderland, but don’t want to miss out precious daylight hours for skiing, we have you covered, too. 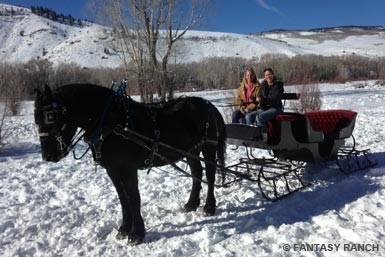 Lazy F Bar Ranch and Crested Butte Mountain Resort offer sleigh ride dinners. Spend the day Nordic or Alpine Skiing then bundle up and hop in a sleigh for a magical night featuring a gourmet dinner at an isolated cabin in the snow-filled woods! This unforgettable experience should not be missed while you’re here in our little Rocky Mountain paradise. Gunnison County has miles of unmaintained winter roads that are perfect for dog sledding. Consider taking a rest day off from skiing to explore the mountains from the comfort of a sled pulled by a team of rambunctious, fiercely beautiful sled dogs. Our local sled dog outfitters will say there is no age limit on who can go dog sledding, but leave it up to parents’ discretion. If you have a wide variety of skiing abilities in your group, consider a day dog sledding to ensure that the whole family can spend some time together. 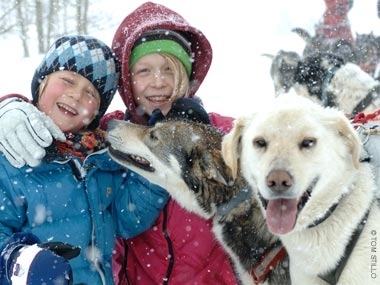 If your children love dogs, they will love getting to meet all of the sled dogs. Some trips even offer a mid-day picnic on a snowy meadow for more special family time.